The first ever “reverse” auction for British electricity capacity closed yesterday, bagging a price which the government said was lower than expected. Fifty companies will be paid £19.40 per kilowatt a year to have power available in the year 2018-19. 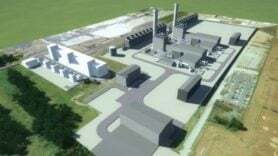 Energy Secretary Ed Davey said this is “fantastic news” and gets the “best” out of existing power stations while “unlocking new investment in flexible plant”. National Grid ran the auction on behalf of government, securing agreements for 49.3 gigawatts’ (GW) worth of power. Nearly half (45%) of this is gas from efficient CCGT power plants, plus another 5% is from flexible but pricey open cycle gas turbines (OCGT). A fifth (19%) is from coal/biomass and the third largest chunk of power supply to make it through the auction is nuclear, with 7.9GW making up 16% of the total. The smallest fraction of capacity is demand reduction, with businesses trimming their energy use via an aggregator known as DSR. Companies offering this service won 0.4% of the capacity auction. A tenth (9%) of capacity is from combined heat and power (CHP) and autogeneration and hydro is providing 1%. The results of the auction are provisional until the Energy Secretary approves them, which is due to be done on 2 January.